Everyone knows that if you want to get on the water and have fun in 5 to 6 knots your kite has to be light. We agree, but if you want to go beyond just mowing the lawn you need a sophisticated kite. The new Turbine not only gets you on the water first, it provides a performance ride and lets you stay on the water even as the wind is picking up. Our progressive Open Delta C design has been updated with a new bridle. We moved from last year’s 3 point LE attachment configuration to a new 5 point cascading bridle attachment system. This is critical for creating a more consistent smooth feel throughout the power stroke when sheeting in and out with the bar. This gives you specific control over the power which significantly increases range on the low end and high end. Additional new improvements include a new lower aspect ratio that is combined with a LE diameter reduction of 9%. The two work together to create more grunt and power without sacrificing riding speed, efficiency or upwind performance. The higher aspect ratio improves lift through kite speed instead of angle of attack. 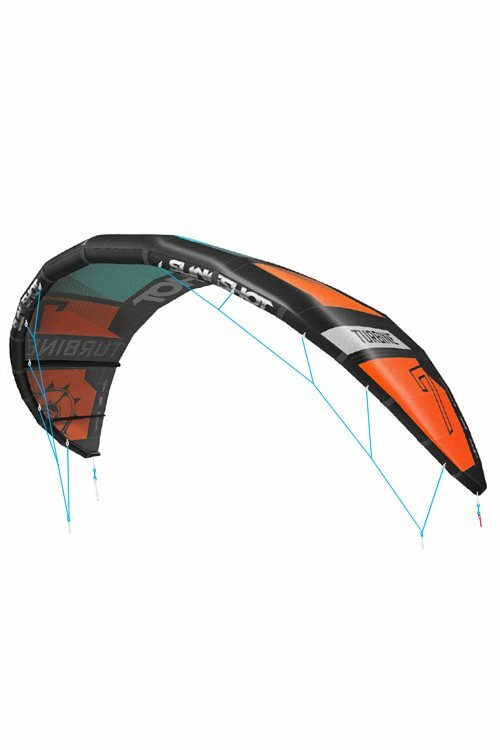 The new geometry allows the kite to fly forward in the window, frees up the wingtips and prevents the kite from oversheeting. Light and crisp in the sky with added durability, increased stability and canopy shaping control. A lighter profile enables better water relaunch in light winds. Packs down tight! Steering lines are connected directly to the forward “sweet spot” geometry of the kite. Now with three settings to micro-tune your bar pressure and turning speed preference. Conical taper shape for low drag and efficient control. Proven to increase turning speed, while reducing drag and creating more efficiency. Fine tuned to optimize ultra-light wind relaunch. Automatically reduces oversheeting and virtually eliminates backstalling while still allowing the panels to open and flex. Creates a more consistent smooth feel throughout the power stroke when sheeting the bar. Designed with no pulleys. Long lasting durability and performance by using only the latest new high tech materials in our LE, canopy,bladders and finish trim materials. The 2014 Turbine has a lot of grunt and power, which is the most important thing for light wind riding. Then, to add to the mix, it relaunches extremely well in almost any wind conditions. To top it off, it also races upwind! 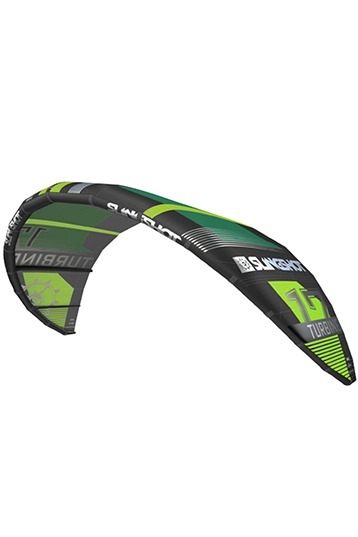 That's pretty much the perfect combo for a light wind kite and it's no wonder the Turbine is such a popular kite in the REAL lesson center and with light wind kiteboarders all over the world. The only negative feedback we have heard from anyone about the Turbine is that it's relatively easy to become overpowered if you try to fly the turbine in 20mph+. We're not sure why you would choose the turbine in those conditions so as long as the Turbine isn't the only kite in your quiver, this won't be a problem! There's a reason that the Turbine is the most popular kite of all time in the REAL lesson center. No other kite has done as much to change the way we look at the sport than the Turbine. So when the wind is 10 - 14mph, we all now look at the water and say "awesome - perfect conditions for the Turbine"!